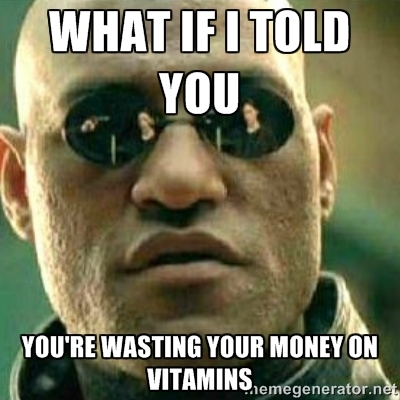 Vitamins and Supplements: Save Your Money! 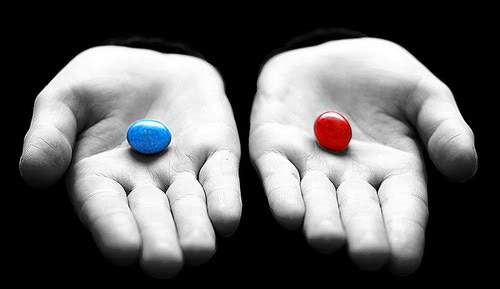 In the 1999 film, The Matrix, Morpheus offers Neo the choice between a blue pill and a red pill. The blue pill is a metaphor for a reassuring lie, while the red pill represents an inconvenient truth. We are all like Neo. We don’t like the idea that we’re not in control of our lives. We like to think that by swallowing vitamins, minerals, supplements, and anti-oxidants, we are able to extend our lives, fend off cancer, and prevent chronic diseases. We like to think that these pills help us to exert control over our health. But these are blue pills. Before you read further, I must warn you: this blog is a red pill. I once knew a medical school professor who believed that–in healthy adults–all vitamin tablets ultimately end up as “vitamin P”, i.e. they make for expensive urine. “You need square meals, not round pills,” he would say. Humans have evolved to extract micronutrients from food in the levels and relationships naturally encountered in our varied diet. There is no benefit from ingesting super-concentrated amounts. Who would eat 100 oranges in a sitting? As far as the general adult population goes, “there isn’t enough evidence either for or against multivitamins.” This is the sentiment of a recommendation statement issued by the U.S. Preventive Services Task Force. The USPSTF, the National Institutes of Health, the Academy of Nutrition and Dietetics, the American Cancer Society, the American Institute for Cancer Research, the American Heart Association, and the American Academy of Family Physicians all agree that healthy adults don’t need supplements. The current evidence suggests that extra vitamins don’t protect the heart, don’t slow cognitive decline, and don’t prevent cancer, or early death. The task force recommends against the use of beta-carotene and vitamin E as preventives because, firstly, they don’t work and, secondly, they may be dangerous. In a nutshell: We think that supplementing with vitamins and minerals don’t help healthy people and that high doses may be harmful. Beta-carotene increases the risk for lung cancer in those who have a history of smoking, and vitamin E supplements increase the risk of prostate cancer in men. Vitamin E supplements have also been linked to increases in all-cause mortality. Several studies cast doubt on the safety of supplements. Large amounts of omega-3 fatty acids may be related to endometrial cancer, and excess folate to colon cancer. High doses of selenium are associated with skin and prostate cancer, while calcium supplements may increase the risk of heart attack. Excess vitamin A can cause severe liver damage. The recommendation applies to healthy adults only, not to children, women who are pregnant or may become pregnant, or people who are hospitalized, have chronic illness, or have known nutritional deficiency. Women of childbearing age should supplement with folic acid because it prevents neural tube defects in their babies. The role of vitamin D is still unclear. Vitamin D supplements are recommended for older patients at risk for falling, and breastfed babies. There is too much research and too many contradicting studies for the lay person to digest. It is, therefore, necessary to always speak to your doctor if you are unsure about the benefits and risks related to your individual scenario. It is easier to pop a pill than to consume a daily variety of fruits and vegetables. It is easier to recline on the couch than to walk for 30 minutes every day. Unfortunately for us, our health is not subject to our convenience. Most of us would be better off if we stopped wasting money on vitamins, and spent more on fresh fruits and vegetables; or perhaps even invest in that gym membership.